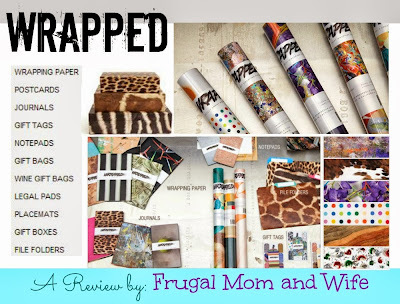 Frugal Mom and Wife: WRAPPED Review! Unique Wrapping Paper, Journals, Notebooks and More! WRAPPED Review! Unique Wrapping Paper, Journals, Notebooks and More! 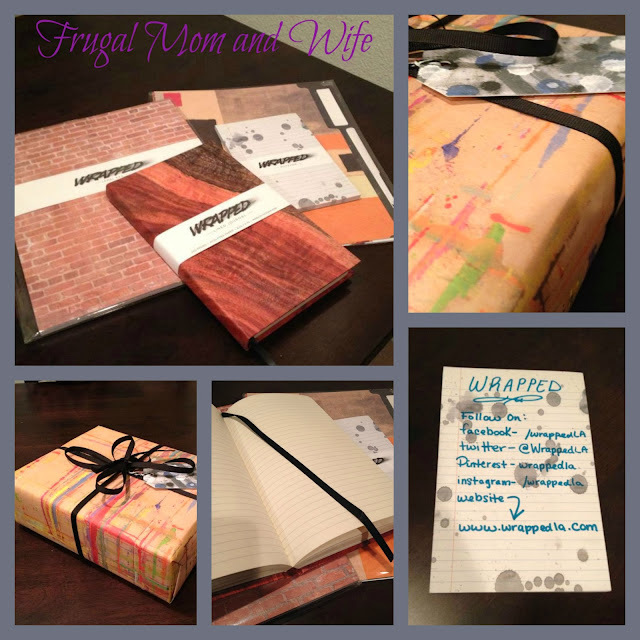 Have you heard about WRAPPED? They are a wonderful company based in Los Angeles that takes gifting seriously. By creating unique products that have their own personality. It all started with a man and his father. His father is a painter so he grew up helping around cleaning brushes, paint, and more. He protects his worktable with butcher paper that gets saturated with paint. He would then tare off pieces of the paper to use as beautiful wrapping paper. All the recipients of his gifts would always be careful not to tear up the work of art their gift was wrapped in. Thankfully they decided to share the wonderful art with the rest of the world. Now you can get their unique items at 130 locations currently and growing. WRAPPED is so unique, that's exactly why I absolutely love their products. Everything they make is beautiful designed and a work of art. It's an honor to wrap any gift with their gorgeous paint splatter wrapping paper with quirky gift tags. Writing in the wood designed journal they designed made everything I wrote feel that much more personalized. Even writing a simple note on their specially design notepad adds so much spice. Stationary never had it this good. WRAPP has done it. Loured me right in with all they are. They are incredible and I know you will think so too. These are too cute. I've been looking for something like this. I would have never thought that someone could make wrapping paper exciting and, even more importantly, unique. Sure, we all use wrapping papers (unless you're my uncle, then you use the comics section of the newspaper) but coming across wrapping paper you immediately want to marvel at and absolutely, positively need? Never would have thought that could be a thing, yet here it is. Wrapped looks amazing! I want some. Oh my, I LOVE the paper that looks like wood and brick. What a fun and easy way to make your gift stand out from the rest! Headed to their site to see what else they offer. These are so amazing! I am am always looking for something different and these are way cool! Thanks so much for sharing!! I need a new journal, so thanks for sharing this company! Thanks for sharing!!!! I journal all the time and the more unique the cover, the happier I seem to be. Great Christmas gifts! This are so great as a wrapping paper, maybe use them also as wallpapers ? This is just so neat. I would have loved to have this back in the day.....when I was in high school when we had to cover our books. We had to use the brown paper bags. lol This would have been so cool to have. I will have to look for this for those special "no reason" gifts. These do look fun and unique and the presentation is everything. Sometimes a gift is more fun because of the way it is wrapped. Having really cool wrapping paper makes a gift so special! I love this, what a unique idea. I have always enjoyed taking gift wrapping into a more personal level and there are some great options here. The zebra box with the red accents is gorgeous. I have a daughter who loves animal prints. That box looks like it would be prefect for little keepsakes. I could not imagine anyone ever throwing any of this rap or boxes away.